Here's my card for this week's My Favorite Things Wednesday Sketch Challenge. I did something I haven't done in a while here, using a stencil with some embossing paste to make an eye-catching background. My background features an array of silver stars and spots, stenciled on a watercolor panel using a Simon Says Stamps stencil and some silver embossing paste. Once the stenciled background dried, I inked it with a trio of blue distress inks to create a gradient of color from light to dark. 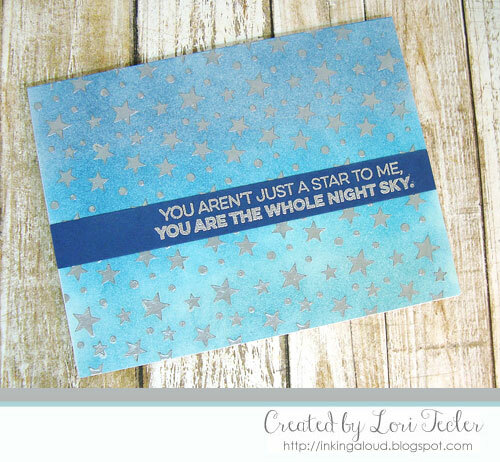 For the sentiment, I stamped the "you aren't just a star to me, you are the whole night sky" sentiment from the Count the Stars set on a dark blue cardstock strip in silver ink. I heat embossed the text in silver so it would pop against the dark background. The strip was adhered to the stenciled panel, just slightly off the center of the panel. The finished panel was adhered to an easy to write on white card base. I absolutely adore the sentiment on this beautiful card!